Born: Christiana, 19 April 1832. Died: London, 18 May 1888. Son of a military bandmaster, Svendsen took lessons from his father at the age of 12 and two years later played first flute in the Christiana Theatre Orchestra. 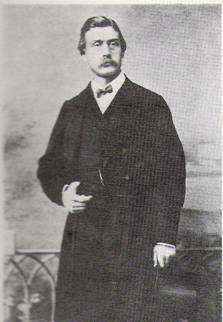 He later studied with Niels Petersen in Copenhagen and Matthieu André Reichert at the Brussels Conservatory before coming to London in 1855 where he played in Jullien’s band at the Covent Garden Promenade Concerts. The following year he became principal at Crystal Palace (1855-1858) and later played at the Royal Italian Opera (1862-1872), the Philharmonic Society (1861-1885) and at Her Majesty’s Theatre from 1867 onwards. Svendsen married John Clinton’s daughter, a noted pianist and joined Queen Victoria’s private band (1860), remaining until his death. He was also Professor at the Royal Academy of Music for twenty years or so and was a fine orchestral player and soloist. His best known pupil was A. P. Vivian (1855-1903) who inherited his master’s characteristics and in turn became Professor at the Royal Academy himself.